Denver is a great city to explore but not everyone can use ride-sharing services to get where they need to go, and not everyone has the budget to rent a car. If you’re visiting Denver and you need to get around town on the cheap, you’ll need to get well acquainted with Denver’s Regional Transportation District, more popularly known as RTD. Denver’s RTD is composed of buses and trains, and you’ll need to use both if you want to get everywhere you want to go. RTD’s bus system is Denver’s primary mode of public transportation though a light rail and commuter rail system also shutters passengers across the Mile High City. Let’s learn everything you need to know about RTD. RTD is divided into two major fare zones — local and regional. Fare zones 1 and 2 are considered local zones while zone 3 is considered regional. Local fare service includes light rail and bus service in zones 1 and 2, local services to DIA, and Call-n-Ride service for those have mobility problems. Regional service includes bus and rail service through a larger portion of the Denver metroplex and offers expanded routes to DIA. Local service is both cheaper and more frequent than regional service though local service won’t get you to all parts of the Denver metroplex. To view RTD’s different fare zones visit RTD’s website and fare zone map. The bus system is Denver RTD’s primary means of public transportation and is the best method of getting to all nooks and crannies of the Mile High City. There are several miles of bus lines and several dozen individual routes. If you need to cover a lot of ground, you will be utilizing Denver’s train system, known as the Light Rail and Commuter Rail System. The Light and Commuter Rails are Denver’s first train system and can help you easily get from neighborhood to neighborhood or quickly through main corridors like I-25 or I-70. It’s still expanding, but Denver’s rail systems are currently comprised of nearly 90 miles of rail and nine distinct rail lines. The Denver Light Rail runs through several parts of the Denver metroplex but is more confined compared to the Commuter Rail system. Multiple Light Rail lines frequently stop throughout the Mile High City. The Light Rail is your best bet at zipping quickly through multiple neighborhoods. The RTD Commuter Rail is like Denver’s Light Rail System but with different trains and routes. Routes on the Commuter Rail system are typically longer than Light Rail Routes and stop less frequently. You can find the current fare and pass rates for RTD below. The first listed price is for the general public; the second price is RTD’s discounted rate. The following fare rates apply to both bus and rail service. Passes are transferable between bus and rail services. A full list of fares and passes can be found on RTD’s fares and passes page. Who Applies for RTD Discounts? Standard local rates are displayed first followed by discounted rates. MyRide tickets can only be purchased through the MyRide app. One-Way tickets are called one-way, but they can last for multiple rides. One-way tickets are valid for three hours and are available for a transfer to bus or rail service. Ask your bus operator for a transfer ticket. Unless you plan on riding RTD frequently for an extended stay, the monthly pass is not recommended. Standard regional rates are displayed followed by discount rates. Service to DIA is also included in all day and monthly passes though you’ll be required to pay a small upgrade free if you’re using a ticket book. Please refer to RTD's website for the most accurate and up-to-date fares. The following services require an airport fare. Airport service fare can be found above. SkyRide Bus: The SkyRide Bus is a limited stop shuttle that runs on an hourly schedule. There are three distinct SkyRide shuttle bus stops servicing the Northglenn / Thornton area, the Boulder/US 36 Corridor, and the Denver Tech Center Area. The SkyRide is an excellent service if someone can drop you off at one of the stops. You should consider other means if you need long-term parking before heading to DIA. 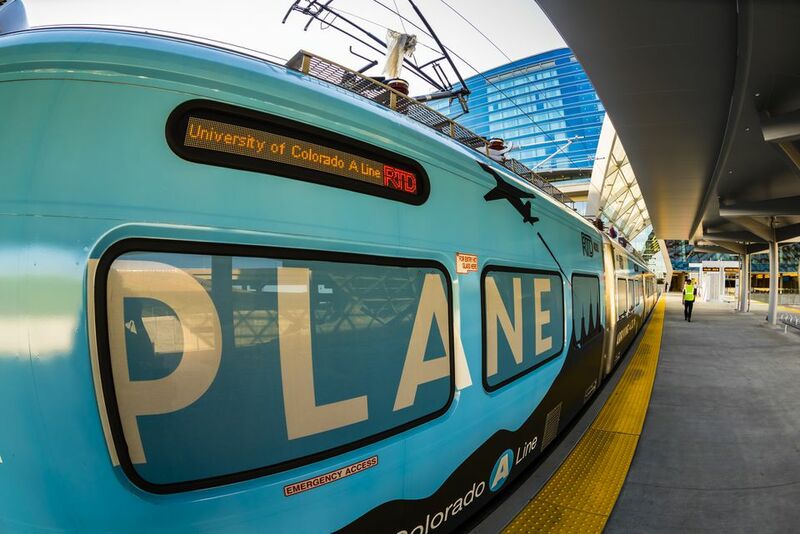 University of Colorado A Line: Known simply as the ‘A Line’ this light rail provides service from Union Station in Lower Downtown, Denver, and through several Denver and Aurora neighborhoods before arriving directly at DIA. There are multiple bus lines with service to Union Station. There are several other routes to DIA depending on where you’re coming from and your preferences. Further information about RTD service to DIA can be found at RTD’s Airport Service page. Both SkyRide and the A Line are specially equipped to deal with travelers with luggage. Bus and rail services offer overhead and under-seat storage for small items like personal items and carry-ons, racks for larger items, and other stowing options. They can even deal with large items like skis. If you have oversized luggage or other items with special consideration its best to contact RTD beforehand to be certain they can accommodate you to or from DIA. Denver’s RTD runs 24/7/365, but not all lines and services are available around-the-clock. Denver has several lines and services that operate twenty-four hours a day, but most services are reduced after rush hour. Where you want to go and how to get there depends on where you are and the time of day. RTD’s full bus map and the schedule is your safest bet at mapping your route. Rail services also vary depending on the time of day and your location. You can find RTD’s rail map and schedule on RTD’s website. You can’t be on time for your ride if you’re pulling out a large transit map every time you need to know what bus to take. Your best options at figuring out your route quickly are Google Maps, Next Ride, and other third-party apps. Next Ride is RTD’s dedicated web app but is not mobile-friendly. RTD lists several third-party apps for making maps and routes on their page on mobile services. MyRide: MyRide is Denver RTD’s dedicated app and the most convenient way to buy passes and fares for all RTD services. MyRide is better-suited for locals, but you can still utilize it on a visit if you want convenience getting around Denver. MyRide is free to download for both Android and Apple iOS. RTD Mobile Ticket App: RTD’s Mobile Ticketing app doesn’t give you the same flexibility and options that MyRide does but is more convenient if you’re just here for a visit. The Mobile Ticket app allows you to purchase different types of RTD passes quickly and is free to download. You can purchase several types of passes on RTD’s website. Physical Locations: You can purchase physical fares and passes at several locations throughout the Denver metroplex. RTD lists its physical ticket vendors and locations to purchase passes on their sales outlet page. Most transit hubs and light rail stations also offer pass purchasing. Both RTD’s bus and rail system meet ADA requirements. Bus and rail service can accommodate wheelchairs and other mobility-assistance vehicles like scooters. RTD bus drivers can assist and secure wheelchairs and other vehicles onto buses, but riders must secure themselves on rail systems. If you need more help than the bus and rail system can accommodate you can utilize Access-a-Ride. More information on Access-a-Ride can be found in the Other Transit section. The bicycle is one of the most popular ways to get around Denver and fortunately RTD can accommodate bikes. Riders can bring their bikes on both RTD’s bus and different rail systems. Riders will need to secure their bikes on the drop-down bike rack found at the front of busses. The light rail system does not have specific spaces for bikes, but they are allowed. Riders are asked to board light rail transportation at the bike-specific platforms towards the front and back of vehicles. Riders are asked to stay with their bikes during the duration of the ride. Commuter rail systems are easier on cyclists with their bike-storage areas. Simply stow your bike in the vertical bike storage areas and enjoy your ride. You aren’t required to stand with your book on the commuter rail. Free mallride: The free Mallride makes limited stops along 16th Street Mall between Civic Center and Union Stations and is a great way to move across Downtown Denver. Free Metroride: Meant primarily for downtown Denver employees, the Metroride offers along 18th and 19th Street between the Union Station Bus Concourse and Civic Center Station. Sportsrides: RTD sets up temporary routes for both local sports games and shuttles to nearby ski resorts. Sportsrides routes and rates vary every season. To find more information on different Sportsrides visit RTD’s maps and schedules page and scroll to the bottom. Flatiron Flyer: The Flatiron Flyer offers express service across 18 miles between Denver and Boulder servicing several northwestern Denver neighborhoods. You can find information on the Flatiron Flyer including stops and fares at the Flatiron Flyer page. Access-a-ride: Access-a-Ride offers pick-up and drop-off services for the mobility-impaired. Access-a-Ride trips can be scheduled throughout the entire Denver metroplex if the requested pick-up or drop-off is within 3/4 mile of the Local RTD system. More information can be found at RTD’s Access-a-Ride page. Park-N-Ride: If you need to park your ride and take public transportation, you can use one of RTD’s many Park-N-Ride lots. Parking fees vary by time and location. Find more information on the seventy unique locations at RTD’s Park-N-Ride page. To learn more about Denver’s RTD including where to buy passes, how to schedule your trip, how to find a specific schedule and more head to RTD’s website. If you can’t find the answers to your Denver public transportation questions in this article RTD’s website will be your best resource.